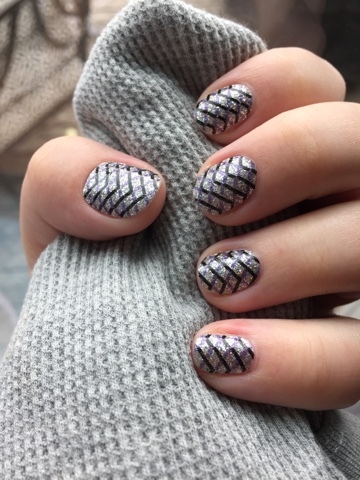 Today's featured look is OPI Pure Lacquer Nail Apps in Zig Zag Sparkle. This was my first time applying this brand of nail wraps and I am definitely pleased with the ease of application. However, the pack it comes in is a one use application, any extras will dry out and cannot be used in the future. A bonus to these wraps is that there is no warming required and the material is very thin and flexible compared to other brands I have tried. This product is not long wearing, it lasted one day on my nails. I think they are great for that person looking for fancy nails for a night out but plan on not wearing them long term. I got these as a gift so I am unsure of cost, I did do some research and found that many places online or in store sell OPI Nail Lacquer Nail Apps and the price ranges anywhere from $3-10(ish). I could not stop looking at my glittery nails! So pretty!